EA Phenomic lures unsuspecting gamers into an addictive, free-to-play, browser-based online strategy game using the name of a beloved classic role-playing franchise in Lord of Ultima, now available for play worldwide. 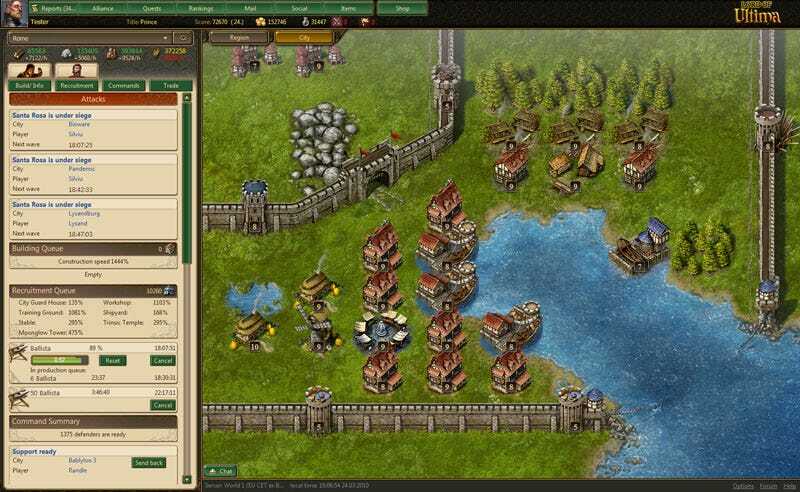 Less Ultima, more Evony without the non-existent scantily clad women, Lord of Ultima is quite an involved little strategy game for a browser-based title. Players stake out their land, build up their city, engage in diplomacy and trade, and then deal with the inevitable end result of diplomacy and trade - war. "Lord of Ultima was designed to ensure that everyone, from strategy newcomers to diehard fans, can make it to the top of the leader board," said Volker Wertich, Creative Director at Phenomic. "Phenomic is committed to building dynamic communities that delight players as they interact with the game, each other and the legendary world of Ultima." It's not a bad little game. I just wish they wouldn't have used the Ultima name for this, as the ties to that venerable series are tenuous at best. See for yourself at www.LordofUltima.com.